My youngest sister recently turned thirteen (how this is possible, I do not know) and I wanted to share a little birthday box I put together for her. These days, it seems so difficult to find something to give a teenager that they'll truly need, use and like—so, with this in mind, I decided to give my sister a variety of items, packaging them in a way that would be fun to receive and unwrap. Spend Me — I put thirteen dollars in a chevron-patterned vellum envelope, added the stamped tag, and wrapped it with a bit of lace. Nibble Me — I didn't have any luck finding small candy items that would fit in this gift box, but I came across some strawberry and cream Tic Tacs that were two shades of pink (and all kinds of adorable…if such a thing can be adorable). I added the stamped tag, a bit of washi tape, and some of my favorite yellow twine. Wear Me — I toyed with the idea of buying her actual makeup items, but I know it's a tradition for my mom to give each of us girls something of that sort when we become teenagers and I didn't want to step on her toes. However, I found the prettiest lipgloss in a pink shade that I know will look lovely on my sister, and included it in the box, along with some hair ties and the last stamped tag. I love using things I already have at home to package items for gifts, or when shipping purchases from my shop. This whole box (aside from the actual gifts) was packaged using recycled items (the small shipping box, packing paper I stamped and used as wrapping, crinkle paper inside the box) or items I already had on hand (twine, tags from Target's dollar bins, alphabet stamps). When it comes down to it, you don't have to spend a ton of money to create a gift with beautiful presentation. If I give myself enough time, I'd love to always do birthday gifts in this same way! This is absolutely adorable! Wonderful ideas! I may have to borrow this idea for the next birthday that comes up! This is such a cute idea. 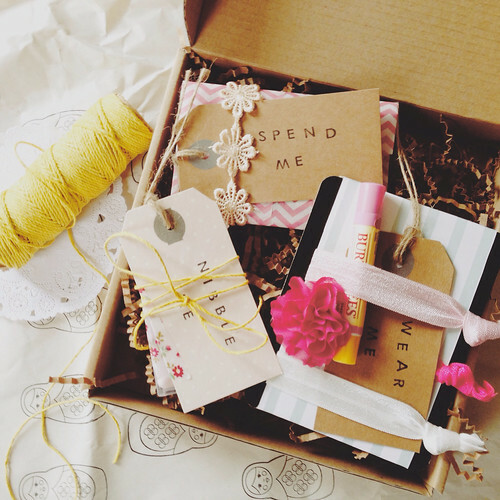 i am sure she will love this gift and your packaging is amazing. I love your craftiness and creativity. That is beyond lovely! You've got such style! Just Lovely!!! My birthday is the end of September...may I sign up for a birthday box??? :) I would love to receive something sooooooo fabulous in the mail! You Rock!